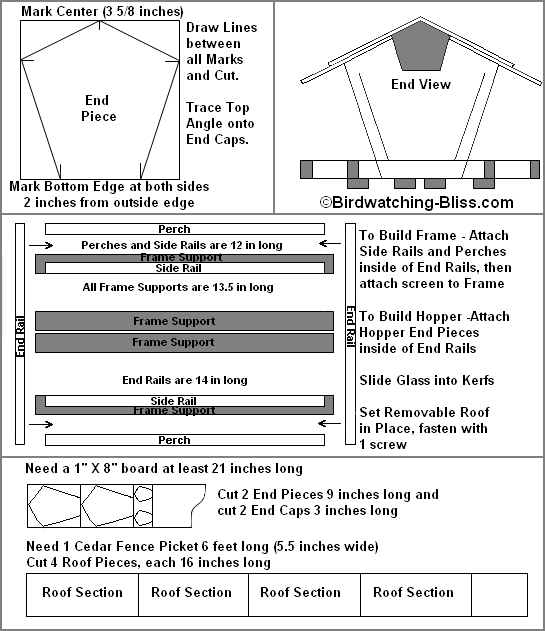 These are fairly easy bird feeder plans for first-time builders, yet is very attractive, especially to the birds! 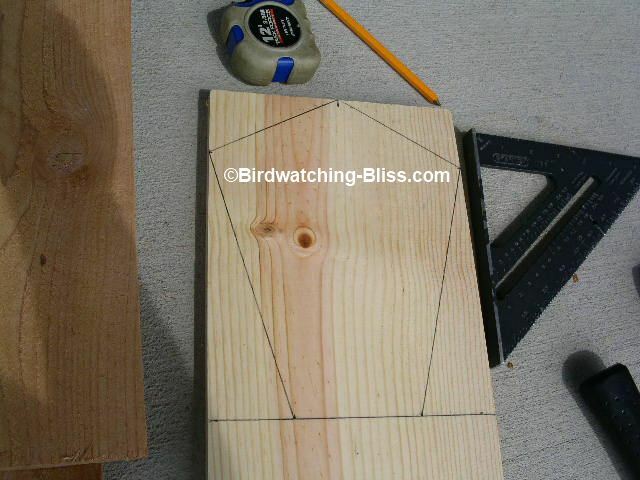 This design will create a large birdfeeder and will easily hold a gallon of bird seed. It accommodates small and large visitors with inner and outer perching areas, is easy to refill and keeps the bird seed dry. We tried to make these plans as simple as possible and for the feeder to be built cheaply. You could always fancy it up, but save your money on the fancy extras 'cause the birds don't care and instead spend it on better seed! One reviewer suggested that the feeder should be called the Extra Large Hopper Feeder or even the MOAB feeder (Mother of all Bird Feeders). It doesn't look that big to me, but four doves can feed at the same time with four more standing on top waiting their turn. One of the main problems we have found with most hopper type bird feeders, is that the bird seed can get wet in the tray and also at the base of the hopper where the seed is supposed to spill out. This causes the seed to swell and block the opening and the bird seed starts to sprout, ferment and mold. We're trying to attract and feed birds, not to make beer out of bird seed. This would seem to be an easy fix by simply increasing the size of the overhang of the roof. Problem is, as you increase the overhang it becomes difficult to see the birds at the feeder. So we are also looking for the right balance between the height of the bird feeder and the amount of overhang of the roof. We purposely designed the overhang to protect the seed tray, but to allow water to drip on the perches so the rain helps keep perches clean. 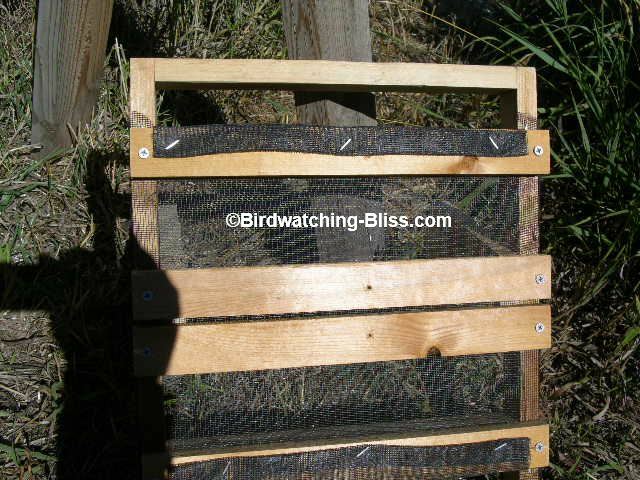 This plan also uses a new idea to help keep the bird seed and the tray dry. Instead of using a solid wood or plywood bottom to the tray, we use fiberglass screen material (just like the screens on your doors and windows). 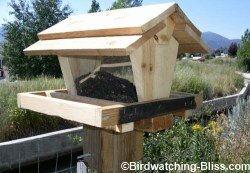 The second main problem with most hopper bird feeder designs is that the hinged roof used to fill the hopper with bird seed tends to leak. Unless you live in the desert, this will just create a big mess and waste bird seed. So this plan is for a solid removable roof. I think the roof is heavy enough to stay in place without any attachments, but it would be simple to hold with a single screw or to drill a hole and attach with bolts or a latch. 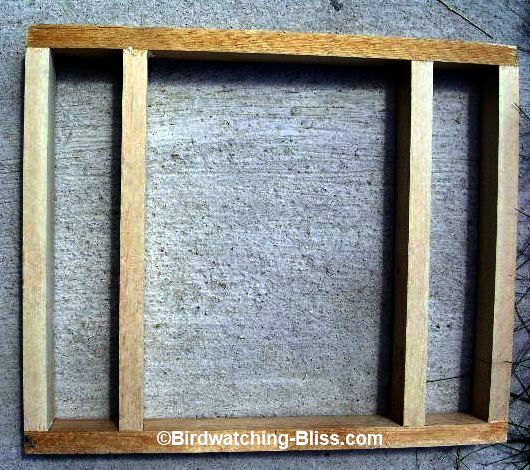 Here is the basic layout and basic instruction for the Large hopper bird feeder. 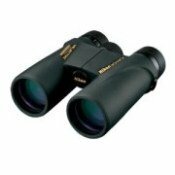 Detailed instructions, material list and exact dimensions follow below. I have tried to keep the design and instructions simple and have assumed that you don't have much carpentry experience and don't have many tools. I have also taken pictures in order to simply the process (a picture is worth a thousand words). I estimate that it would take a beginner between 2 to 4 hours to make the cuts and assemble the bird feeder (not counting time looking at plans etc). Ok, so it probably won't be perfect on your first try, but at least you tried. And if somebody doesn't like it... Tell them to go kiss a bird's cloaca! So let's get started on this build a bird feeder project. 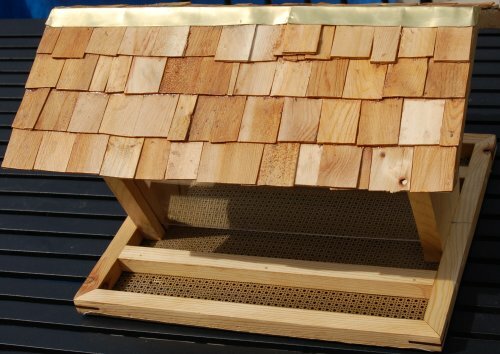 Note: A visitor amended our plans slightly to make a beautiful extra-fancy version with a cedar-shingled roof, copper lined roof cap and a hinged roof to make it easier for filling the feeder. 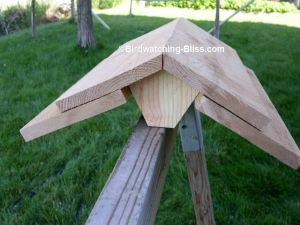 I have found that cedar fence pickets are a cheap source of wood suitable for outdoor uses like bird houses and bird feeders (especially makes good roof material). They are 6 feet (72 inches) long X 5½ inches wide and 5/8th inch thick and cost less than $2 each. I used fence pickets for the roofing material for the bird feeder. I used pieces from a 1 X 8 pine board for the Hopper End Pieces and two 1 X 2s for the tray framing, support for the screen and for the perches. 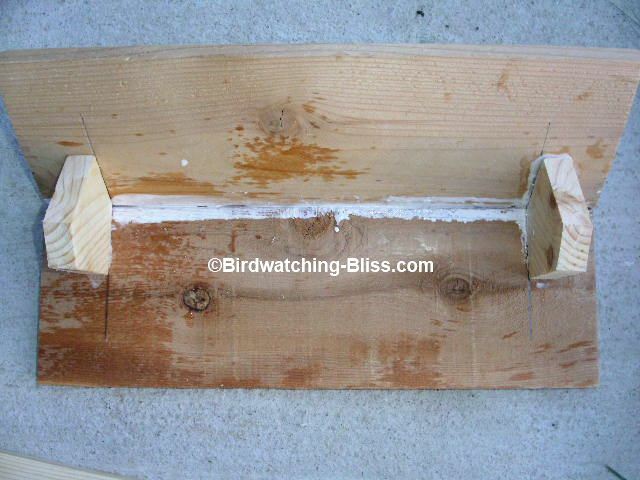 The bird feeder can be made entirely with scraps of wood or siding that you already have lying around. 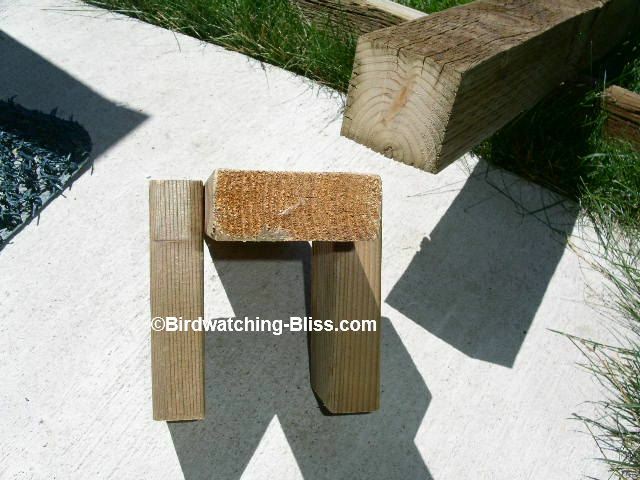 Chances are, if you have scraps of wood lying around, you already have the know-how and the tools to build a bird feeder. If not, see the materials list below. This plan is also designed to use glass or plexi-glass (polycarbonate sheeting) so you can see how much bird seed is in the hopper, but you could use a solid materials like masonite or thin plywood for the hopper sides if you prefer. Table saw or sliding chop saw - for all square cuts and to miter cut roof caps and to make kerf cuts - safer and better cuts than with circular saw. Staple gun - to attach screen to frame. Brad gun - make easy work of attaching all parts. 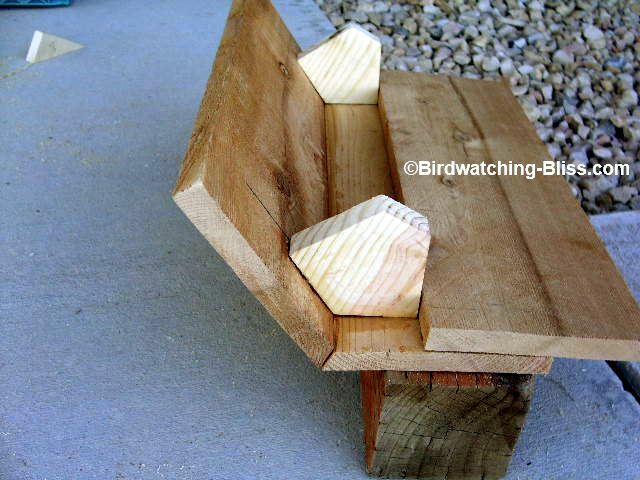 Router and round-over bit - to round top parts of frame and perches for finished look (for people - birds don't care). Full disclosure: I used a chop saw for making the square cuts, a circular saw and clamps for the miter and kerf cuts and a staple gun to attach the screen. Be very careful. If you don't feel confident with making the kerf cut, the glass or plexi-glas could be mounted on the outside with sealant and large pan-head type screws to help secure it in place. The glass will be mounted permanently instead of being removable, but better to be safe than sorry. It's not that important, we are just trying to feed birds, not solve the World's problems. We have a lot of photos, but couldn't place them all here because it makes the page load too slow, so instead they are referred to via the blue links. Just click to view the image related to the particular directions. Turn so 9 inch side is up. 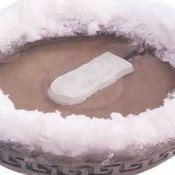 Mark Center (3 5/8 inches). Mark Each Side, 2 inch down from top. Draw Straight line from Center to Each Side mark as shown in diagram. Mark the bottom 2 inches from both sides. Draw Straight line from Each Side mark to each bottom as shown in diagram. Make the 4 cuts on the Hopper End Piece. If not sure of your measuring and marking ability, use the 1st cut Hopper End Piece to mark the second End Piece. Make the 4 cuts on the 2nd Hopper End Piece View Finished Hopper End Pieces . If not satisfied the 2 Hopper End Pieces are similar enough, clamp together and file and sand until even Example showing clamped Hopper End Pieces. The measurements of the End Caps are not critical, but the angle on the top of the End Caps is critical. The end caps are cut to the same angle as the end pieces, which determine the angle of the roof. The end caps fit under and are attached to the roof. The roof section (with end caps attached) then slides down over and sits on the end pieces. The weight of the roof holds the roof in place unless it is very windy, then the roof is held in place with a screw. Cut a 3 inch section from the 1 x 8 board, then cut that piece in half. These two, 3 x 3 5/8 inch pieces will be the End Caps. 3. Mark and square cut the 4 roof pieces (from cedar fence picket) - each 16 inches long. Note: If you have the tools and ability to miter cut the roof crown, the exact angle is 28.89 degrees. I could only set the angle of my saw to just under 30 degrees. If not making the bevel cut, you should fill the gap with exterior or silicon caulk later. Mark the new outside edges of both Hopper End Pieces ½ to 1 inch from the outside and mark straight lines down both sides of both Hopper End Pieces. Cut grooves on these marks about half way through (3/8 in for 3/4 inch board) - the grooves only need to be the thickness of your glass or plexi-glass panels - saw blade is probably thick enough. Note* There are several different ways to control seed flow from the seed hopper into the feeding tray - small seeds need only small gaps - be careful not to create gaps or notches too large so too much seed spills out. Can always make a notch or gap bigger, but if the plexi-glass is cut, you can't make is smaller again. 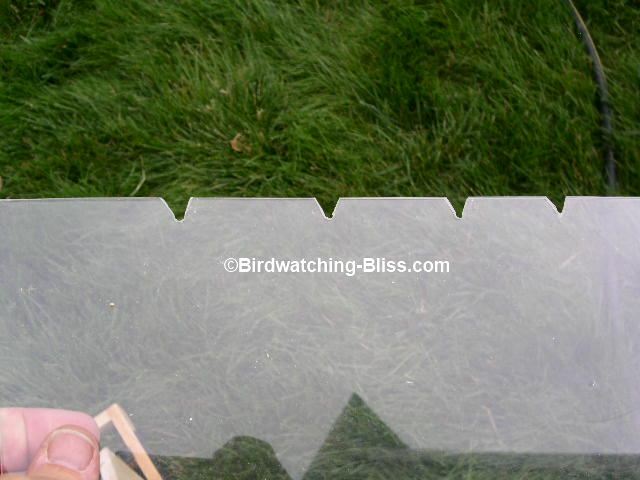 Option 2 - If using plexi-glass, notches or archways can be cut to let the seed spill out. Drill small hole first to prevent plexi-glass from splitting. Then score with utility knife until it breaks. Now you have all the pieces ready for assembly. For each 16 in Roof Piece, make a mark 2 inches in from each end. Then line the Roof End Cap up with the marks so there is 2 inches of overhang. The Roof End Caps serve two purposes. First to serve as base to glue and tack the roof pieces together and second to fit snugly over the two Hopper End Pieces that make up the hopper. So measure the spacing carefully so the roof will fit over the 12 inch inside space of the hopper. Align the End Rails with the Side Rails and Perches between them as in diagram above and the finished frame base. All of these pieces are set with the long sides vertically and short sides flat. Fasten the End Rails into the Perches with glue and one screw at each corner. Then Fasten the End Rails into the Side Rails. 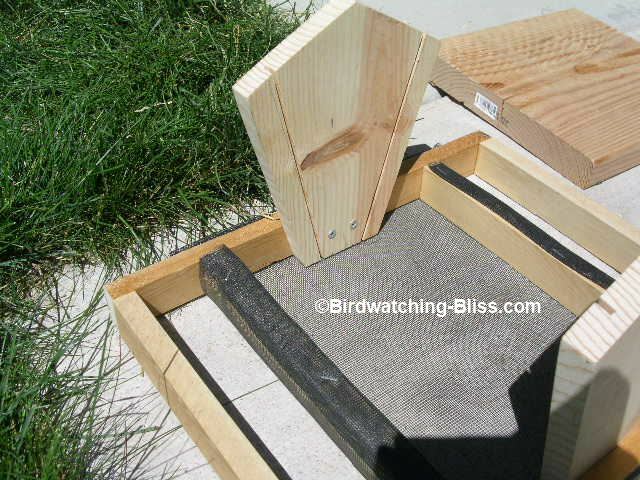 Lay the screen material over the frame of the hopper feeder. Cut screen material leaving several inches overlap on each side. Fold the extra screen material several times for strength to hold the staples and pull the material tight around a corner and staple. 4. Attach the frame and Screen Supports (4 pieces) with screws only (In case we need to replace the screen). Note - the screen sags too much without these supports. Center two of the Screen Support pieces s in the middle of the hopper area and then one at each end. These support pieces are set with the long sides flat and the short sides vertically. Then finish stapling the screen to the outside Screen Support pieces. Attach the Hopper End Pieces to the inside rail of the frame base with glue and tacks or screws. Slide the 2 plexi-glass panels into the grooves (kerfs) on both sides. If they don't fit well at first, try a different fits by turning the panels upside down, backwards and reverse sides. If the glass or plexi-glass is too large, glass would have to be re-cut, but plexi-glass could be filed or sanded. Before cutting, you might only need to slightly widen or deepen the kerf cut. Simply set the roof on top of the two Hopper End Pieces to cover the hopper. If you live in a windy area, you might want to fasten the roof with a screw, pin, bolt or latches on each side. Now it wouldn't hurt to protect the bird feeder with some paint or polyurethane to help it last longer, but I plan to leave mine au natural, especially the cedar roof. 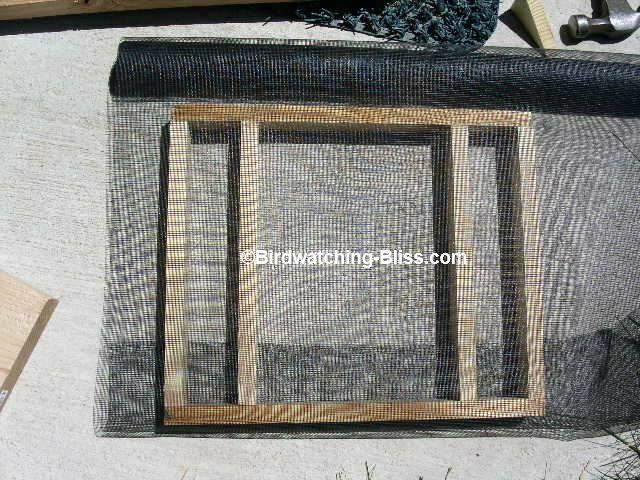 Now all you need to do is decide where you want to put it and how your going to put it there, then fill it up with bird seed and sit back and watch the birds. Now that is Bird Watching Bliss! So far we have used only black oil sunflower seeds to attract bird species such as finches, chickadees, pine siskins and grosbeaks. It has kept the nuisance birds like house sparrows and starlings out and there has been little waste if any. If you haven't heard this old saying, then it's time you did. Measure twice and cut once. If you ignore this advice and measure once, sooner or later you will have to cut twice. And sometimes there is no cutting twice as the board is ruined. So take your time. When in doubt? Measure again! If you are not experienced using a power saw, be very careful. Losing a fingers is not one of today's goals. You don't want to have to have explain to everyone the rest of your life how you hacked off your finger, though it might make a good story. If you are under 18, use a hand saw. 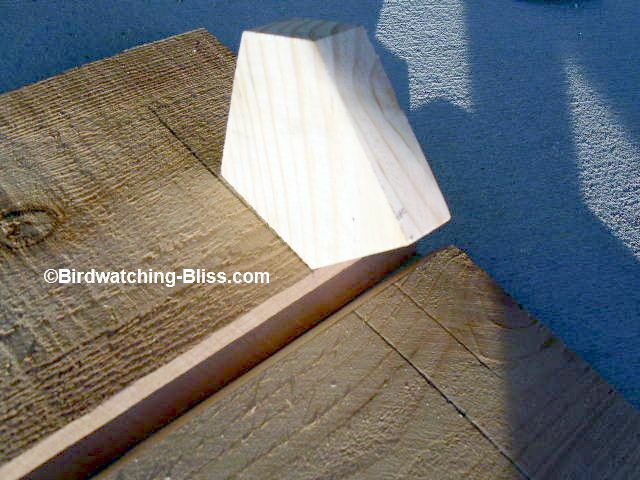 Practice some cuts on scrap wood until you learn how to make the saw blade follow your marks and which side of the mark the blade actually cuts, especially if you attempt the bevel cut for the roof. For longer cuts, try clamping another board or level to use as a guide. If new at using a hand saw, go slow and easy. We know you are strong, but don't force the saw with those monster power strokes. When you apply too much force, the blade tends to twist. The cut starts to bend and the blade gets pinched in the wood. Remember, we are supposed to be having fun and lowering our blood pressure, so smile and slow down. 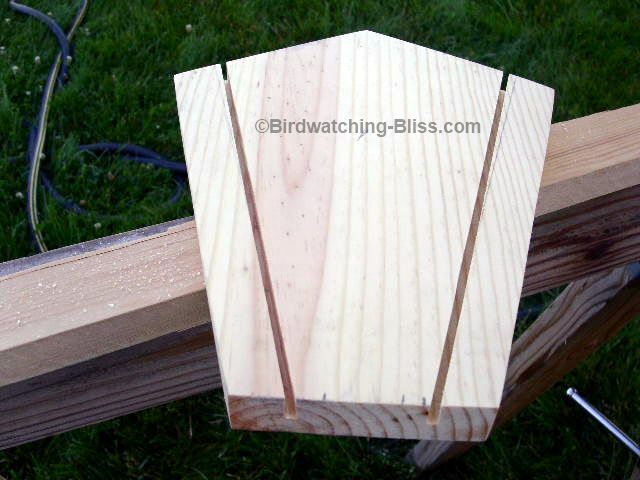 If you simply want to attach your new birdfeeder to a post or to your deck, the floor of the feeder can simply be screwed into the top of the post. A PVC pipe placed around a post will help keep the squirrels away. I don't have problems with squirrels, so I didn't use pvc pipe, but did make a simple post attachment made from pieces of 2x4 that fit snuggly to the post. Then I drilled a hole through the post and both sides of the 2x4s and fastened with a bolt. 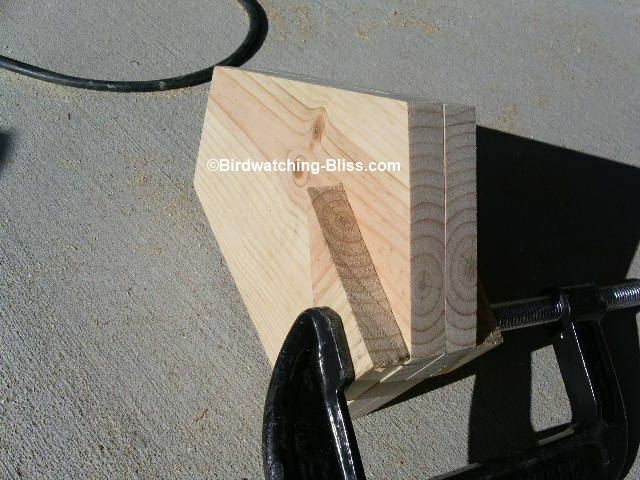 If you want to temporarily place the bird feeder somewhere to see how you and the birds like it, you can clamp it to a post or deck rail with "C-clamps". If you want to hang the bird feeder, the simplest way might be to place an eye bolt through each End piece of the hopper. Remember the Roof overhangs the ends by 2 inches on each side, so the eye bolts need to extend at least 2½ inches, plus the thickness of the wood, plus at least enough on the inside for a nut to grab the bolt, so that means you need two 2¾ inch or 3 inch eye bolts. 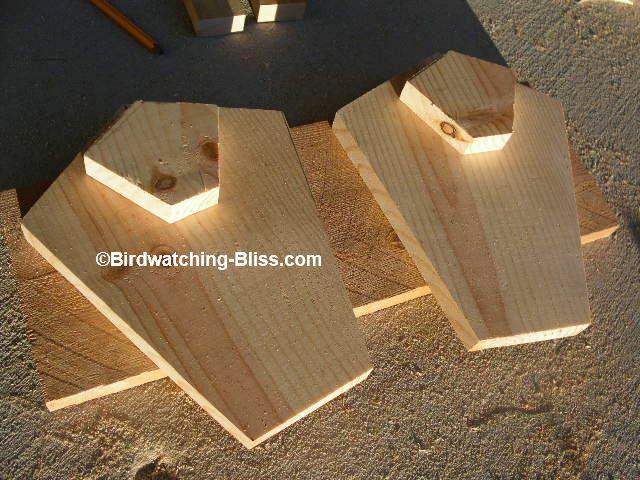 Drill holes for the eyebolts, insert each eyebolt with a nut and washer inside and outside of the bird feeder. Attach a chain or rope to the eye in each bolt and hang. But remember that you would have to undo both eyebolts each time to refill the hopper. 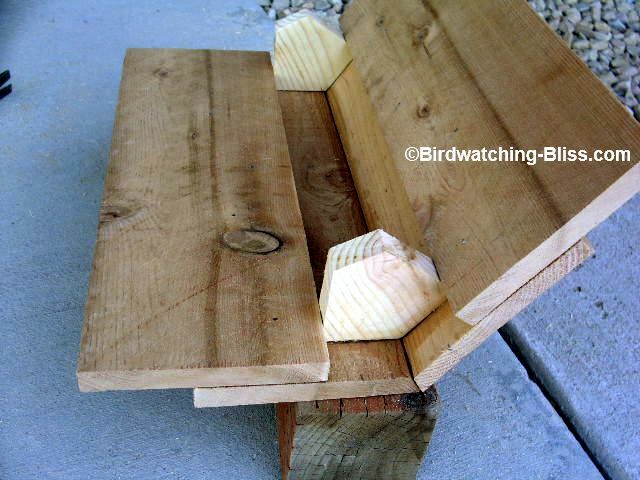 Perches could be made from two ½ inch diameter wooden dowels - Simply drill ½ inch hole in each end of the End Rails, slide in the dowels and glue into place. We received feedback from Troy, who claims the dowels reduce the number of squirrels and house sparrows. You could add some extended perches so more birds have places to perch, or so that larger birds like doves will have a larger "landing strip". 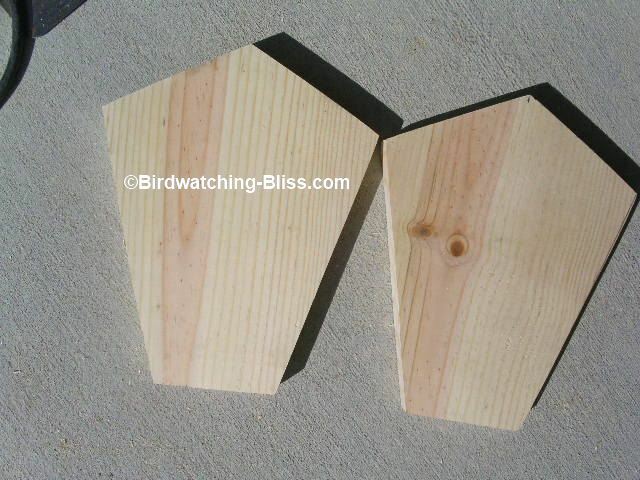 As we build more, we will be adding more plans for bird feeders in the future. 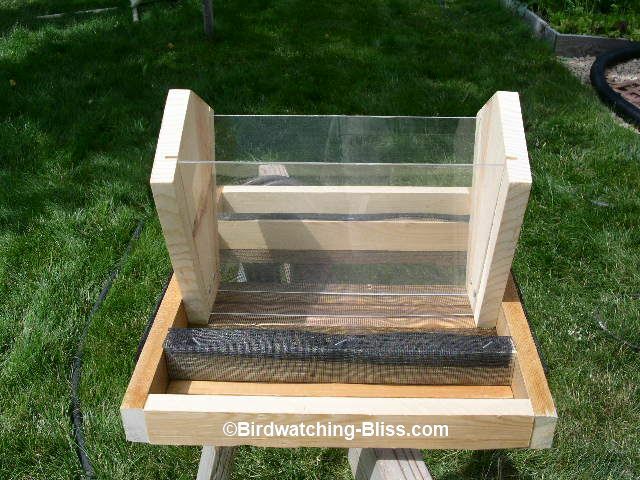 If you build this feeder, let us know and show it off here! We would be happy to post your photos, design alterations, etc.. and share with other prospective bird feeder woodworkers. There has been controversy as to whether or not bird feeding is beneficial to birds. If you enjoy attracting birds to your backyard and love watching and learning about them, then it doesn't matter...But take the below precautions for the birds' welfare. Bird have feeding preferences for food as well as for how they feed. Some are ground feeders while others will feed from perches. So think about the birds first, then choose your feeder. And just as important, don't forget to fill your feeder with the kind of bird food that your birds desire. If they don't like what's on the menu, they'll move onto the next restaurant! We have also found some great books that contains lots of easy plans for bird feeders as well as more elaborate, decorative style plans. Remember, you do have an ethical obligation not to jeopardize wild birds with your feeders. 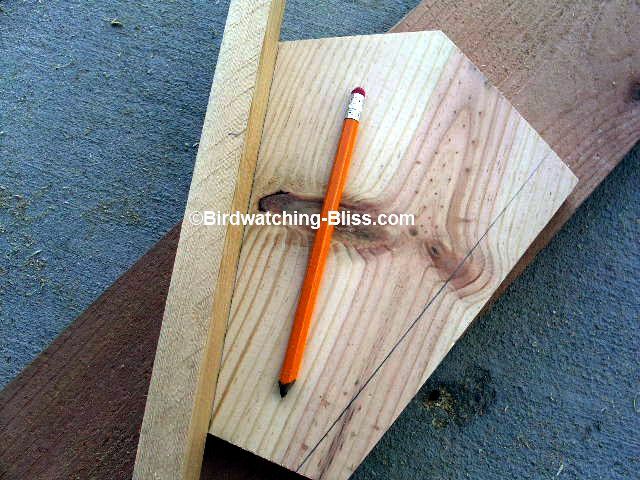 Here are some great free bird feeder plans you can make at home. Make it a family project and get everyone involved. Make sure everyone is aware of caring for the feeder (cleaning and filling) which translates to caring for the birds. And most of all, enjoy learning about the birds that come to your feeders and create your own birdwatching-bliss! Platform, Hopper, Tube, Suet, etc. 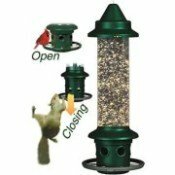 Just as there are many different kinds of birds, there are many different kinds of feeders such as platform, tube and hopper. It all depends on which birds you wish to attract. Top-rated, best bird feeders chosen by bird watchers. Want to feed birds, not squirrels? This feeder is one of best squirrel proof feeders on the market. Attach right to your window with one-way mirror. Attract Baltimore Orioles as well as Hooded, Orchard and Bullock's Orioles with a combination fruit bird feeder. And tips for making your bird feeder squirrel-proof and perhaps build a feeder just for the squirrels to keep them away from the bird feeder. Also best squirrel feeder.